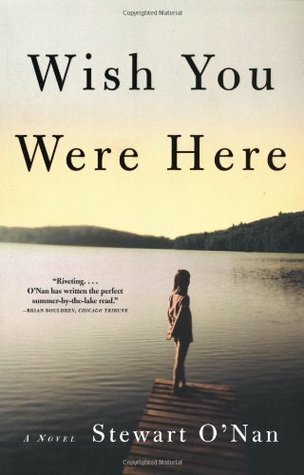 Wish You Were Here (Stewart O’Nan) was one of those reads, surprisingly enough. I carried it all the way to Vermont, around with me whilst we were there, and then all the way back, and yet – I still didn’t finish it. It does have a scary amount of pages, that is true, but I adored his sequel novel to this one, Emily Alone, which makes it puzzling why I didn’t really love this one. Perhaps because it’s an earlier novel in his oeuvre? Perhaps because there was a slew of characters and it got a little bit confusing at times? Perhaps it needed a big chunk of committed reading time and I couldn’t/didn’t give it that? Reviewing Goodreads (which nearly always has some hilarious reviews on it for the titles that I read), it’s a mixed bag, but quite a few note that it’s a long book, and it’s made even longer because none of the characters grow in any way. The setting is a week-long vacation at the family’s lake house. It’s raining for most of that week, the most exciting thing is what’s in the fridge, and it’s never-ending for the adults involved. It was never-ending for this adult involved as well. It’s the typical plot: long grown up children gather for family event (in this case, the father’s death) and then end up having to spend x amount of time together whilst ends get sorted and memories/feelings get aired out. (See also the much more successful read of This is Where I Leave You [Tropper], and others of that ilk.) Perhaps I was not in the right mood to deal with these adult siblings (each with their particular well-trodden family role: loser, mediator, distant daughter/son-in-law etc.)? This is pretty well written, all the different strands of each character are well developed and then woven into one piece… So why wasn’t this the best experience? Looking back, I think I became a little impatient with the characters and wanted to tell them to grow up a bit lot. Plus it was slightly predictable, plot-wise, and that’s always a mark on the Naughty List for me. This entry was posted in books, Fiction and tagged American, domestic, drama, Fiction by lizipaulk. Bookmark the permalink.